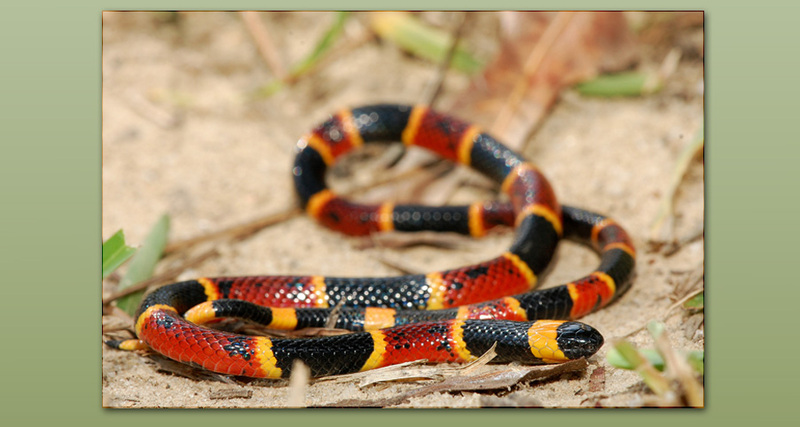 Note the rings on the coral snake are distinctive and encircle the entire circumference of the snake’s body. Also note the colors red touches the black on the Scarlet king in contrast to the red touching the yellow on the Coral. This can easily be remembered with the rhyme "Red touches black, friend of Jack and Red touches yellow kills a fellow". The "nose" area of the Coral snake has a distinct black end as shown in this picture. It should be noted here that these "rules" for identifying these snakes only apply to the species found within the United States. Species of Micrurus are also found in Central and South America. Identification of those species is more difficult. The bite of this snake yields an extremely lethal toxin. However, its short fangs render it ineffective in most cases of delivering a bite, except on bare skin. This along with it secretive and reclusive nature means it does not usually present a danger to humans. This is despite the fact that its venoms is similar in a general sense to that other elapids, such as the cobras, and can cause respiratory paralysis. reveal the color similarities it shares with the Eastern Coral snake.